Home Areas Frankley Cofton Park travellers move on – what plans for the future? There have been travellers setting up temporary camps throughout the area for a number of months now. The group of travellers that have been camping at Cofton Park for around a week were moved on by Birmingham City Council this evening. BCC had served the travellers with a seven day notice last week, but they tried to get around this by leaving the site and then returning the following day. 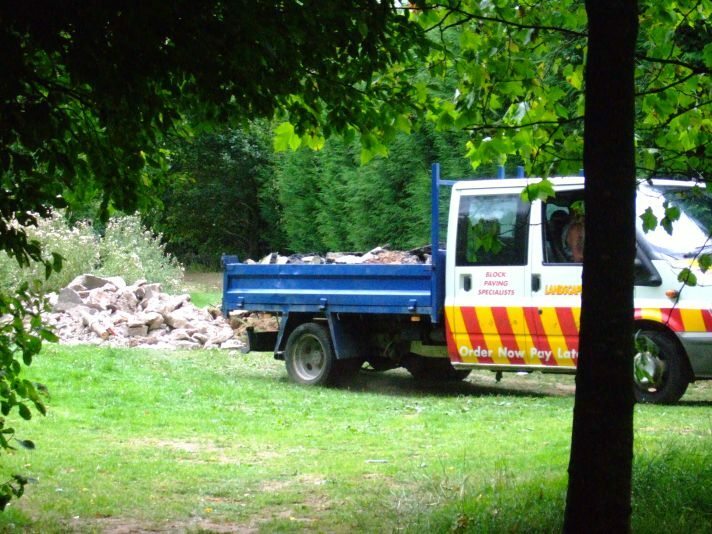 After local residents had complained about the amount of mess and dangerous waste that they were leaving in the park, BCC sent in an emergency team to remove them from the site today. Residents are now hoping for a quick clean up of the rubble, waste and excrement left in Cofton Park and looking for answers as to how illegal encampments can be prevented in future. This is a difficult issue with no easy long term solutions. Over the last month or so we have seen travellers setting up camp behind Meadow Brook Road in Weoley, then on the Egg Hill Estate, then on Frankley and then on Cofton Park. My appeal is twofold. First to the travellers themselves. If you do camp in this area then local people who live here deserve respect. That means clearing up and not causing damage in the areas in which you have camped. Of course, it has to go both ways. We have seen some appalling mess in the last month but some travellers do treat local people with respect and we should respond positively when they do so. My second message is to Birmingham City Council. Council officers, the police, local Councillors like Andy Cartwright and Ian Cruise, and campaigners like Fiona Saxon in Weoley have worked hard to get travellers moved on within the law, to get the areas cleaned up afterwards and to make sure there are physical barriers to further encampments where appropriate. But this all costs a fortune and we’ve got to move beyond this revolving door where either the Council, the Police or both move travellers on only for them to reappear a mile or two away within a few hours. That means we have got to face the fact that there are not enough official sites on which travellers can camp in this part of the West Midlands. The one which Birmingham Council does provide in the North of the City hasn’t worked for years. The Council needs to sort that site out and work with neighbouring local authorities to provide another one elsewhere to supplement it. You can’t force travellers on to official sites but you can’t encourage them to move to useable sites that aren’t there. We have asked Cllr Timothy Huxtable, cabinet member for Transport, Environment & Regeneration if the council has any plans to improve and extend legitimate facilities for travelling families and await his reply. Update 17th August – Mr Huxtable is away at the moment, so we are awaiting a response from the council. Longbridge Cllr Ken Wood (Con) has commented below. We have been told that the travellers have now moved near Reaside Clinic on Great Park. Having worked on getting the travellers removed from Cofton from the day they arrived and having been up to the park to see for myself the mess that has been left I would like to make the following comments. Firstly I would like to say thanks to the Park Rangers who are now having to clear up the mess which ranges from building rubble to domestic waste to human waste ! I am sure we will soon have the park looking good again. Whilst having some sympathy with some of the local MPs comments it is very difficult to have any sympathy for people who commit criminal damage by uprooting posts in order to trespass who then leave a mess as described above for the Council to clear up. The cost of this is met by everyone paying Council Tax ie local residents. There are undoubtedly some responsible travellers out there but unfortunately our experience seems to be more related to the kind that pay nothing in taxes, pay nothing to the council and just create havoc. As for the future I dont think anyone wants to see Cofton fenced off but measures need to be taken to protect our parks from this happening and I will be having discussions with officers to try and see what can be done. I’m told the travellers have now moved to fields at Reaside. It seems this is going to constantly go around in circles. Are the council going to look at better provision of legal encampments, as Mr Burden suggests? With regards to looking at better provision its a case of where do you put it as no one wants one in their area, probably because of what we know happens in the majority of cases ie the mess and filth left behind. Personally I would far sooner make better use of any spare land by finding ways of building more badly needed houses for the people of Birmingham, and as we have done recently, the ex servicemen from our Armed forces. Unfortunately this is very difficult as you have to have backing evidence to prove that the person you charge is indeed the one who tipped it so either witnes them doing it or have CCTV footage. These people know the law inside and out and continually take advantage of it. On my part I would love to be in a position where we could do exactly what you suggest and add criminal damage, trespass and whatever else we can find. What about photos such as above? This summer in Longbridge we have had our fair share of the problems that the travellers bring with them rubbish left behind bushes used as toilets anti-social behaviour. All three councillors have worked hard to move them on and get the areas cleaned up as soon as possible. When they first come to the egghill estate I went to help and support the residents and got MP Richard Burden involved we both were very concerned Richard wrote to BIRMINGHAM CITY COUNCIL with his concerns. I set up a meeting with residents, police and Birmingham city council staff. The meeting went well and we all said that prevention was the best answer we must try our best to make it hard for them to get on these areas in our ward. The cost over the summer to move them on must run into thousands and I praise the council workers who do a great job cleaning the mess up. I would also like to thank Cllrs Ian Cruise for his support and Cllr Ken wood and MP Richard Burden we all want the best for the Longbridge ward. We all need to work together in partnership to try our hardest to put up better barriers to make it harder for these travellers to get on to our parks and fields in Longbridge and Birmingham city council need to change the law on what these travellers can and cannot do. The residenrs of Longbridge, Northfield, Kings norton and weoley castle have had enough. Working hard for Longbridge, Frankley and Rednal.